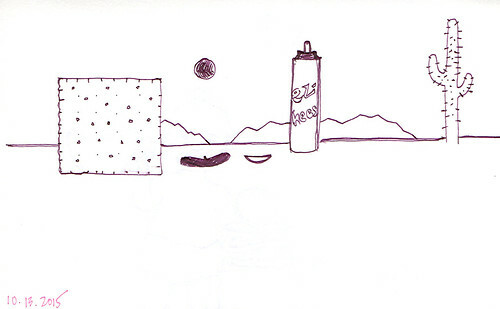 I've been diligently drawing every day but just hadn't taken time to scan everything until today. So here's the massive catch-up post. Last night M. and I had dinner at Pho 69 and checked out TechShop in downtown San Jose. 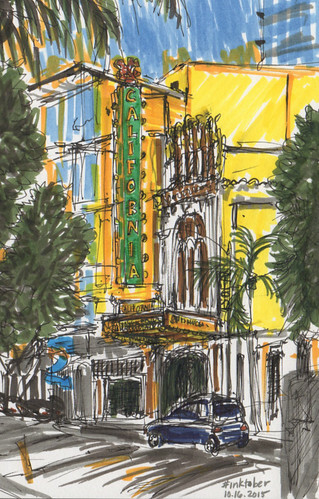 In between I sketched the California Theatre, a '20s-era movie palace turned performing arts venue. 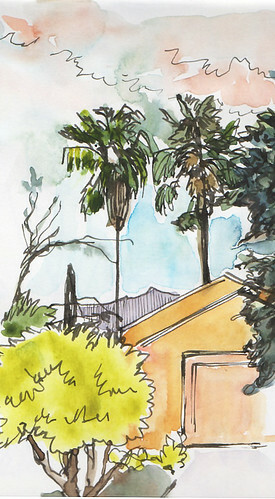 The day before, I drew the two trees and distant hills I see every day out our front door. They are tall and totemic and remind me that I am in California. Finding InkTober subjects on busy weeknights was challenging until M. and I hit upon the idea of using word prompts (from vintage copies of Sunset magazine, found at Kepler's Books in Menlo Park) to inspire me to draw random things and tie them together. 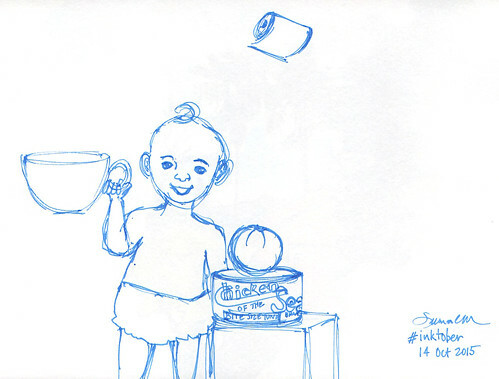 M. thinks teacup-tuna-toilet-paper baby will go viral. Me, I'm rooting for the Saltine desert. It's hard to do it without any prompts -- I end up mostly drawing what's in front of me, and at 10 pm it starts with whatever I see in and around the mirrored bedroom closet doors. Last Sunday M. and I rode our bikes at Viva Calle SJ, an open streets event in which miles of San Jose roads were closed to cars. 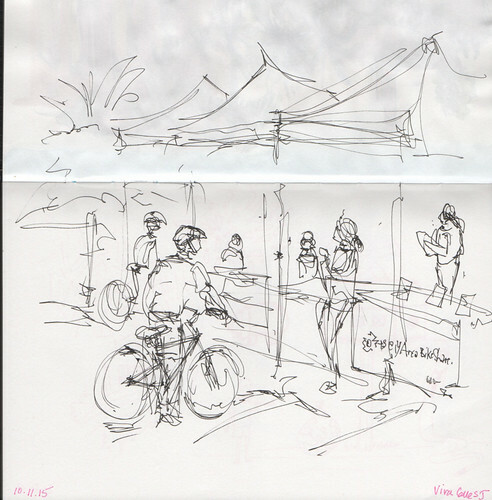 I sketched at the Aztec dance demonstration by Tezkatlipoka Dance Group and then drew the cyclists who had gathered at the information tents at Parque de los Pobladores. 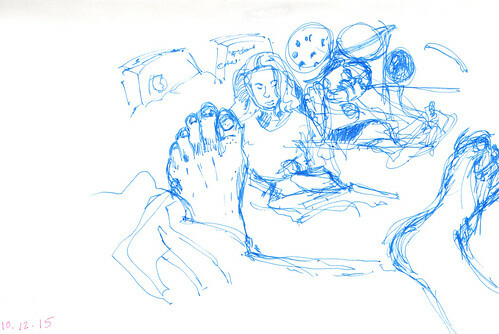 It is hard to keep up with a sketch a day, especially when there are other things that take place in life. 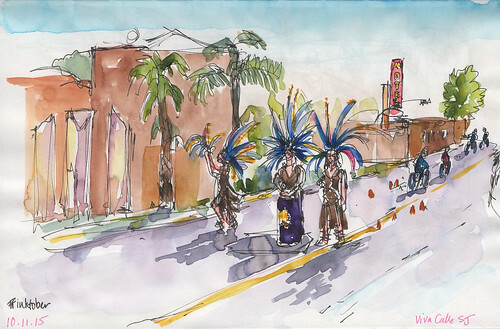 I love seeing the sketches of your area.